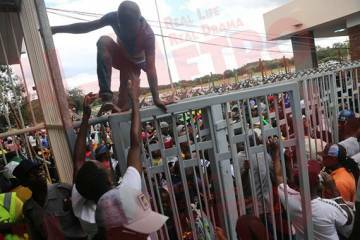 ONE person died and three were injured during a stampede as people wrestled with security to gain entry at National Sports Stadium yesterday. Egna Nyamadzawo, who was in the company of her husband only identified as Baba Lee, is believed to have suffocated when fans who jumped to gain entry fell on her at Gate 3. 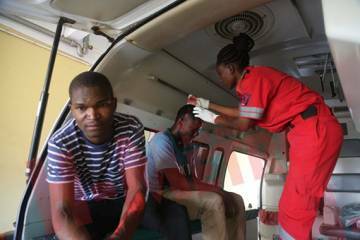 Two men and a woman were injured and rushed to hospital while another man got injured while celebrating victory in a match that ended 2-0 in favor of Zimbabwe against Congo Brazaville. Baba Lee told H-Metro that the death of Egna was a double blow since she had lost her brother few days ago. “I doubt that God exists my brother. This is so painful we lost her brother two days ago and today what is this? Said Baba Lee in tears. “I was in South Africa and she is the one who phoned me saying she had bought a ticket for me only to come and die like this. “If you closely look at her attire it is similar with mine and I do not know what to do now,” he said. 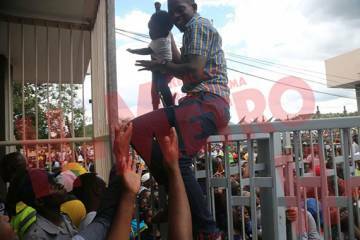 Police and Peace Security officers failed to control a number of people who wanted to gain entry at the last hour. One of the police officers and Peace Security officer Enos Mutasa, 54, who were manning Gate 3 failed to give a satisfactory answer after they were caught by a member believed to be of Anti-Corruption. They were forced to tear the tickets off in front of fans who booed them.